Can a High-Efficiency Furnace Be Installed in the Attic? How do you prepare your heating and cooling systems for their respective seasons? Without argument, the best way to do this is by scheduling routine system maintenance. Maintenance tune-ups give our pros the chance to fully inspect your system, making any adjustments needed, cleaning the unit, and alerting you to any repair needs that exist. 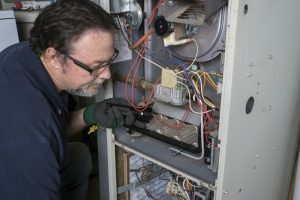 The best time to have this done is typically in the fall for your heater and in the spring for your air conditioner—but it’s actually more important that you have in done regularly, no matter the time of year. HVAC maintenance is oftentimes forgotten, or at least, not prioritized by homeowners. We encourage you to not only schedule this service annually but to enroll in a maintenance program. There’s actually a number of great benefits to signing up for a maintenance plan, such as our Club Maintenance Plan. Keep reading to learn what these advantages are. There are a number of ways that maintenance helps home comfort systems. But the main benefit that’s most immediately important is that this service simply makes your air conditioner and/or heater more dependable over the season that you need it. The last thing you need is your air conditioner to fail during the hottest day of the year, or your heater to malfunction during the coldest. Routine maintenance tunes up and cleans your systems, as well as helps us locate potential problem areas, so you won’t have to worry about making it through the season comfortable. An HVAC system that fails years before its estimated time to do so means you are spending money you weren’t expecting on an expensive replacement. If you want the best return on your initial investment in your HVAC system, then you want it to last as long as possible, and routine maintenance is the way to make this happen. The wear and tear that your HVAC systems suffer from over the years will eventually add up to a drop in system efficiency. On average, your heater or AC system loses 5% of its energy efficiency for each year you skip maintenance. Therefore, it won’t be long before your energy bills are much higher than they should be. Annual maintenance can keep a system running at 95% of its initial efficiency throughout its service life, keeping your utility bills down no matter the season. We’ll stay top of it for you! We understand, it’s easy to let HVAC maintenance slip from your mind when you’re busy with other things. A maintenance plan overcomes forgetfulness, since we’ll be the ones to contact you with a reminder that it’s time for your tune-up. Contact Wall Heating & Air Conditioning, Inc. today for furnace repair in Snellville, GA and other reliable heating services.